The 2017 Nissan Titan is one durable truck. Under the hood is a capable V8 engine that generates a whopping 394 lb-ft of torque. This allows you to tow up to 12,640 pounds when properly equipped. The Titan also comes with a tall ride height and bold exterior, offering improved visibility and ground clearance. When you get behind the wheel of the new Titan, you won’t want to leave. Drive the new Nissan Titan today. The 2017 Nissan Titan comes in five trims: S, SV, Pro-4X®, SL, and Platinum Reserve. Each trim comes in Crew Cab configuration only, and with standard rear-wheel-drive (RWD) and available four-wheel-drive (4WD). The Pro-4X® trim comes with 4WD only. Why drive the 2017 Nissan Titan? This durable truck comes with tons of great features that sets it apart from competitors. This includes a removable gooseneck hitch, an available Around View® Monitor, and the innovative NissanConnectSM system. Naturally, this truck has impressive performance thanks to its rugged exterior and 5.6-liter V8 engine. Learn just how impressive the Nissan Titan is at Carriage Nissan today. *EPA estimates. Your mileage will vary. The Nissan Titan is a durable truck designed for hard work. This model is perfect for towing and hauling, and it also has a distinct exterior that’s perfect for tough terrain and harsh driving conditions. 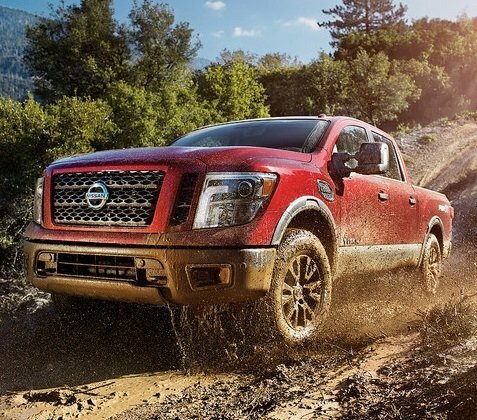 In short, the new Nissan Titan is the ideal truck for those looking for versatility and capabilities. Read on to learn more about the 2017 model year. The Titan comes with an Endurance® 5.6-liter 32-valve V8 engine that gets up to 390 horsepower and 394 lb-ft of torque. There are also 4×4 options available for those looking for added handling, while towing equipment comes standard on the SV trim level and up. Whether you’re hauling a boat, jet ski, or camper this summer, the new Titan is the right truck for you. When properly equipped, this pickup has a maximum towing capacity of 9,740 pounds and a maximum payload of 1,950 pounds. The special PRO-4X® trim comes with all-terrain off-road tires, Bilstein® off-road performance shocks, an electronic locking rear differential, a transfer case, and lower radiator skid plates—it’s a truck that’s specially designed for off-road enthusiasts. Whether you’re looking for a durable truck that’s great for towing or an off-road-capable pickup, the new Nissan Titan is the truck for you. Stop by Carriage Nissan to learn more about the 2017 model year.